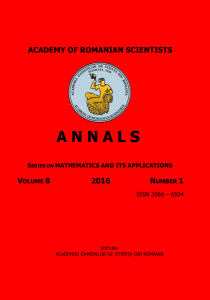 The journal Mathematics and Its Applications is part of the Annals of the Academy of Romanian Scientists (ARS), in which several series are published. Although the Academy is almost one century old, due to the historical conditions after WW2 in Eastern Europe, it is just starting with 2006 that the Annals are published. The Editor-in-Chief of the Annals is the President of ARS, Prof. Dr. V.Candea and Academician A.E. Sandulescu is his deputy for this domain. Mathematics and Its Applications invites publication of contributed papers, short notes, survey articles and reviews, with a novel and correct content, in any area of mathematics and its applications. Short notes are published with priority on the recommendation of one of the members of the Editorial Board and should be 3-6 pages long. They may not include proofs, but supplementary materials supporting all the statements are required and will be archivated. The authors are encouraged to publish the extended version of the short note, elsewhere. All received articles will be submitted to a blind peer review process. By submitting a contribution, the authors confirm that the article is not published or sent for publication elsewhere and the copyright remains the property of Editura Academiei Oamenilor de Ştiinţă din Romania. Two issues are published every year, starting with 2009, both in electronic (ISSN 2066-6594) and printed (ISSN 2066-5997) form . Special issues devoted to International Conferences or other important mathematical events will be also considered. The journal is indexed or will register in international data bases as SCOPUS, EBSCO, ISI, Mathscinet, DOAJ, Zentralblatt fur Mathematik and other specialized information forums. Mathematics and Its Applications has an Open Access policy: all content is freely available without charge to the user or his/her institution. Users are allowed to read, download, copy, distribute, print, search, or link to the full texts of the articles in this journal without asking prior permission from the publisher or the author. No submission or processing fees are required.